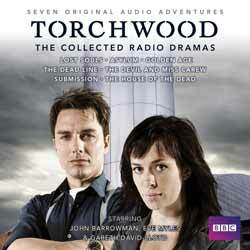 Nowadays we have a regular supply of full-cast Torchwood audio dramas coming to us courtesy of Big Finish, but before that range began there was a more sporadic series of 45-minute plays from BBC Radio 4. This box set contains all seven of them. Voices from the past are calling out from the Large Hadron Collider, and scientists are disappearing. Can Torchwood help…? The collection begins with Lost Souls, which was originally broadcast on 10 September 2008 – the same day that CERN’s Large Hadron Collider (LHC) was activated, in order to re-create the conditions just after the Big Bang and give scientists an insight into what the universe is made of. The LHC experiments sparked quite a few news items that pointed out that the resulting particle collisions could produce microscopic black holes that could, in theory, bring about the end of the world – fears debunked by CERN. However, the fact that the experts were unable to foresee that the LHC would have to be stopped nine days later, because about 100 super-cooled magnets overheated, doesn’t instil a great deal of confidence in their ability to predict the outcome of their experiment with any real certainty. This audio drama examines what, in the Torchwood universe, might be awaiting scientists and mankind once the experiment is underway. Following the deaths of their colleagues Owen Harper and Toshiko Sato (who are poignantly recalled in the dialogue), only Captain Jack Harkness (John Barrowman), Gwen Cooper (Eve Myles) and Ianto Jones (Gareth David-Lloyd) are left of the team who protect humanity from the unknown. Fortunately, they are aided on this mission by Martha Jones (Freema Agyeman), former travelling companion of the Doctor, now working for UNIT. While the acting is fairly good on the whole, especially from the delightful Agyeman (though Barrowman hams his way through the occasionally line), it’s Joseph Lidster’s plot that really shines through. This is an interesting concept that is tied in neatly with the mass-media speculation surrounding the LHC. In addition, there’s a bonus 25-minute programme, Torchwood: All Access, which goes behind the scenes of the television show. This was originally broadcast on BBC Radio Wales, and features showrunner Russell T Davies and members of the cast and crew. While this is interesting, there are problems with the sound on some of the interviews. PC Andy Davidson turns to Torchwood after he arrests a very unusual shoplifter. Who is Freda, and where she is from…? The success of Lost Souls led to the commissioning of three more radio episodes, which were broadcast over consecutive afternoons from 01 to 03 July 2009, the week prior to the television transmission of Children of Earth (without doubt, Torchwood’s finest season). These episodes were particularly welcome at the time, as there was a distinct lack of Doctor Who in 2009. This audio drama has polished production values and the acting is universally excellent. In fact, I’d go as far as to say that I enjoyed this entire trilogy more than I did the first two seasons of the television series. The scripts (this one’s by Anita Sullivan) appear tighter and the performances are much improved. Tom Price swells the depleted ranks of Torchwood with the welcome return of the sympathetic semi-regular character of PC Andy, Gwen’s former police colleague, and Erin Richards’s portrayal of Freda is particularly impressive. The girl’s intriguing dialect, a strange mixture of English and Icelandic but with a Cardiff accent, works well in this medium. It’s always interesting to see or hear about other versions or divisions of the Torchwood Institute, be it the Victorian era of Torchwood One (represented by Amy Manson as Alice Guppy and Heather Craney as Emily Holroyd in the episode Fragments) or Glasgow’s mysterious Torchwood Two (mentioned fleetingly in Everything Changes). In Golden Age, written by James Goss, we discover that the organisation also has an Indian arm – which comes as a shock to Jack, as he thought he had shut the place down more than 80 years ago. He’s even more surprised to find that its members, including an old flame called the Duchess, haven’t aged a day. What is the secret of their eternal youth, and how is it linked to an energy field that has caused the simultaneous disappearance of hundreds of people…? It helps that in the medium of audio there are no budgetary constraints on the realisation of an overseas division of Torchwood, which makes for a nice change of scene. The power of the listener’s imagination helps to visualise things that would have been harder to achieve convincingly on television. The pictures are better on the radio, as they say. What really elevates this drama up a notch or two is Jasmine Hyde’s portrayal of the rather mad Duchess, who makes a pleasing reference to the Yeti from Doctor Who. Lost Souls had Martha Jones, Asylum had PC Andy, and in The Dead Line the returning supporting character is Gwen’s long-suffering husband, Rhys (Kai Owen). He has a prominent role in both this and the next episode, The Devil and Miss Carew. The main characters come across at least as well on radio as they do on screen, if not better, though the stand-out moment in this episode (which is written by Phil Ford) is Gareth David-Lloyd’s emotional speech as Ianto Jones to an unconscious Jack Harkness. Doña Croll is the only member of the guest cast who seems to force her lines. She plays the eminent neuroscientist Stella Courtney, another of Jack’s old girlfriends, who aids the team in their race against time to find the source of the ‘infection’ and save the patients. Unfortunately, the actress delivers an occasionally almost pantomime performance. This is probably not entirely her fault, as the director (Kate McAll) should have steered her towards a more believable portrayal. Even so, there’s no chance of you slipping into a coma while listening to The Dead Line. Gwen and Rhys are involved in a nursing home mystery. What is Miss Carew’s connection with a series of national power cuts? The final three radio dramas were originally broadcast on 11 to 13 July 2011, to coincide with the UK television debut of Miracle Day, though they hark back to the same period as the previous plays, when Ianto was still a part of the team. This episode, written by Rupert Laight, starts off promisingly, if rather reminiscent of the Doctor Who episode The Idiot’s Lantern, but it could have done with more time to unfold. We never really learn what the mysterious Fitzroy’s other recruits have been doing for him – were they working at Miss Carew’s IT firm, or elsewhere? It is also unfortunate that we are given another medically themed plot straight after The Dead Line. On the plus side, Fitzroy himself is splendidly voiced by the silky tones of Martin Jarvis. Again, very Radio 4! Following visits to CERN in Lost Souls and India in Golden Age, the medium of audio once more enables Torchwood to travel farther afield than television production would usually allow. In Submission, the team go on a sub mission (geddit?) to the Mariana Trench, the deepest part of the world’s oceans. Jack pulls strings with the US government and UNIT to get them aboard the USS Calvin, a destroyer that happens to be heading for the Trench. From there, they board the Octopus Rock, the only submarine built to withstand the pressures at that depth, to follow a signal they first heard in the waters of the River Severn. Ianto Jones plays a leading role here, as his past involvement with Torchwood One is mentioned. He calls in a favour from a former colleague, Carlie Roberts (Erin Bennett), who’s an expert in marine geology. Gareth David-Lloyd sounds a little more gruff than usual – coming across more like the comedian Rhod Gilbert. Making a nice change, though, Carlie is an old flame of Ianto rather than Jack. There’s a real sense of awe as Carlie shows the Torchwood team the wonders of the ocean depths, including the strange ecosystems that surround black smokers (hydrothermal vents). Through Carlie’s dialogue, writer Ryan Scott reminds us that we know more about the surface of Mars than we do about this environment. Unlike the writers of Miracle Day, Scott does not overlook the fact that Captain Jack is omnisexual, not merely homosexual, as is demonstrated when Jack tries to flirt with Carlie – though his charms don’t work on this particular woman. The writer also throws in several fan-pleasing references to Doctor Who, including name-checking UNIT and the Time Lord himself. The box set saves the best for last by ending with The House of the Dead. The title refers to a reputedly haunted public house, which is about to close its doors for the final time. Barry the barman (Bradley Freegard) has invited a renowned psychic, Mrs Wintergreen (Rosalind Ayres), to hold a special séance to mark the occasion, and there’s a large crowd of customers hoping for the chance to see their deceased loved ones one last time. However, when Jack Harkness arrives on the scene, he’s determined to stop them. Gwen and Ianto are puzzled by Jack’s behaviour – why is he acting so strangely…? Ianto truly comes to the fore in this episode, which takes full advantage of the involvement of Gareth David-Lloyd and the listener’s knowledge of the tragic loss of his character during Children of Earth. In a way, this episode is the antithesis of The Devil and Miss Carew, in that it initially appears to be a fairly regular adventure… but writer James Goss has a trick up his sleeve, which is both ingenious and extremely moving. I can’t say much more about this story without spoiling it for you, except that David-Lloyd and Barrowman act their socks off, while Goss ties up a loose end of the show’s mythology regarding the Rift. With radio plays that are superior to many of the television episodes – and certainly better than Miracle Day – it could well be that audio is the perfect medium for Captain Jack and his crew. If you’re missing Torchwood, and especially Torchwood as it used to be circa Children of Earth (dare I say its golden age? ), then this collection is for you.